If you’re like most bloggers and entrepreneurs, you’re always on a quest for “more”. More email subscribers. More site members. More revenue. One way to get “more” is boosting your site’s traffic. Another way to get “more” is by doing more with the traffic that you already have. A/B testing, also known as split testing, helps you unlock the latter by giving you the tools to optimize your existing content and pages to increase your conversion rate. It lets you find the variations of your landing pages, popups, and copy that elicit the absolute best results from the traffic that you’re already getting. In fact, I bet that you already know how important A/B testing is. But maybe you think it’s too complicated to set up on your own website. That may have been the case five years ago. But A/B testing isn’t complicated anymore. And to prove it, I’m going to share some of the best split testing tools for users of all knowledge levels and budgets. Whether you want a high-powered split testing tool that works with any content or something platform-specific that sits inside your WordPress dashboard, you’ll be able to find a solution on this list. Let’s get started so that you can get testing! Thrive Optimize is a popular A/B testing plugin from Thrive Themes, the same company behind the popular Thrive Architect page builder. One of the big benefits of Thrive Optimize is just how easy it makes it to create an A/B test. I’ve tried several different methods for creating A/B tests on WordPress and I haven’t seen a simpler implementation (though I will share some non-WordPress tools that offer the same ease of use). You can even set it up so that Thrive Optimize automatically starts using the winning variation after certain criteria, that you can set, are met. You can easily divide traffic between the different variations to get the exact split that you want. 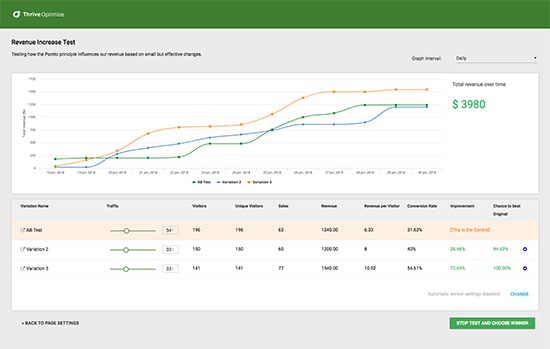 And you can view all the important data right in your Thrive Optimize dashboard with some beautiful charts. One thing to note, though, is that Thrive Optimize only handles standard A/B tests – not the more complicated multivariate tests. That should be fine for most users, though. You Pay…a one-time fee for unlimited tests. Price: Starts at $127 for a bundle with Thrive Architect. If you already own Thrive Architect, you can get the standalone plugin starting at $67. And you can always get access to both by purchasing a Thrive Themes membership starting at $19 per month (paid annually). Is Thrive Optimize right for your needs? Functionality wise, Thrive Optimize is easy to use and makes it easy to A/B test your WordPress content. Whereas Google Optimize will work with any of your content, Thrive Optimize only works with WordPress pages…and it works best with pages that you’re already using Thrive Architect on*. *You need to use the Thrive Architect interface to create A/B tests – but Thrive Architect will still work with pages that you created via the WordPress Editor, so you should be able to use it on all WordPress pages. Additionally, Thrive Optimize is an add-on for Thrive Architect. So even though you can use Thrive Optimize on regular WordPress pages, you will at least need both plugins installed for Thrive Optimize to work. If you’re already using Thrive Architect to build your content layouts – then great! You should definitely pick Thrive Optimize over the other tools. If you’re not using Thrive Architect, though, or if you want to test content that goes beyond just WordPress pages, then you might want to consider something else. Google Optimize is a free A/B testing tool from – you guessed it – Google. Think of it kind of like Google Analytics, but for A/B testing. In fact, that comparison is pretty important because you install Google Optimize on your site by linking it to Google Analytics and then adding some additional code snippets. Once you get those snippets in place, you can start running A/B tests for any content on your WordPress site just by pasting in a URL. A/B test – Test two or more versions of the same page against one another. Multivariate test* – Test two or more elements on a page to see which combination creates the best outcome. Redirect test – Send traffic to two or more completely different URLs, rather than just changing elements on the same URL. This is technically A/B testing as well, Google Optimize just breaks it into a separate option. *Multivariate testing is a more thorough and complicated way of testing changes. While it’s helpful, it’s also really only usable for high-traffic sites. This post has a great explanation of the difference between A/B testing and multivariate testing. 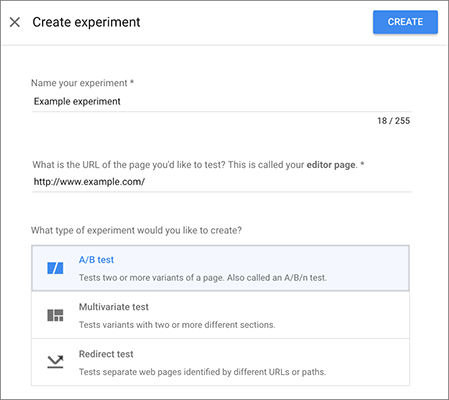 For A/B or Multivariate tests, Google Optimize gives you a code editor that lets you actually click on specific elements on your page to create the variations, which helps make things a bit more beginner-friendly. Once you create your variants, you can set up all kinds of targeting for visitors, including geotargeting, behavior targeting, and lots more. And once you start gathering data on your tests, you can either view it right in the Google Optimize interface or via the regular Google Analytics interface. Price: Free. While there is a paid enterprise plan, the free plan is plenty powerful for 99.9% of website owners. Is Google Optimize right for your needs? First, it will work with literally all of your WordPress content. Google doesn’t care if you created your content via a page builder, your WordPress theme’s settings, the regular WordPress editor, or any other tool. Second, Google Optimize is 100% free for regular users, which is pretty dang awesome. But the main drawback of that flexibility is ease of use. Google Optimize definitely requires a bit more technical-savvy than the other tools on this list to run A/B tests. And while you don’t necessarily need to configure each of these scary-sounding terms, they are good reminders that Google Optimize is targeting itself towards a little more technical crowd. That definitely doesn’t mean you need to be a developer – I’m not and I can muddle my way through it just fine. It just means that if you’re not at least familiar with basic coding principles, you might want to go with some of the more beginner-friendly tools on this list. Leadpages is a popular landing page builder and lead generation tool. While it is a standalone service, it integrates with WordPress quite easily thanks to its dedicated WordPress plugin. 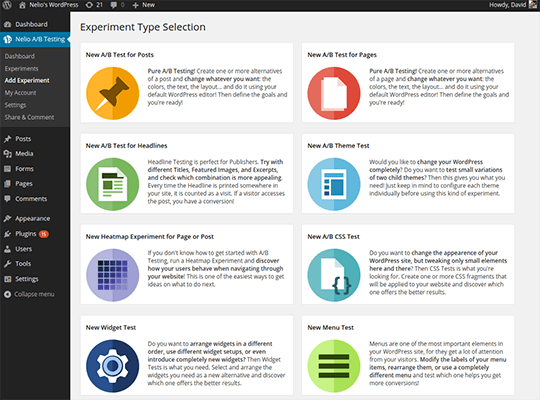 As part of its landing page builder, Leadpages includes an easy A/B testing tool. I’m going to focus mostly on the A/B testing functionality for this post – but you can learn more about the entire Leadpages package by reading my Leadpages review. In terms of ease of use, it doesn’t get much simpler. Running an A/B test isn’t any more complicated than building a regular landing page, which makes Leadpages great for non-technical users. And Leadpages can also handle both A/B testing and multivariate testing, which is helpful if you want the depth of multivariate testing. Price: While Leadpages itself starts at $25 per month, you’ll need the $48 per month plan (paid annually) to get access to the A/B testing functionality. Is Leadpages right for your needs? Functionality wise, Leadpages’ A/B testing functionality is about as simple to use as it gets. So I don’t think there’s anything to worry about on that front. First, Leadpages’ A/B tests only work for the landing pages that you create via the Leadpages interface, so you won’t be able to test regular WordPress content. If you’re planning to create all your important landing pages via Leadpages, that shouldn’t be an issue. But it is definitely something to consider. Second, Leadpages is a hefty monthly charge, as opposed to the one-time fee offered by something like Thrive Optimize. Like Leadpages, Instapage is a standalone landing page builder tool that also includes user friendly A/B testing as part of its package. 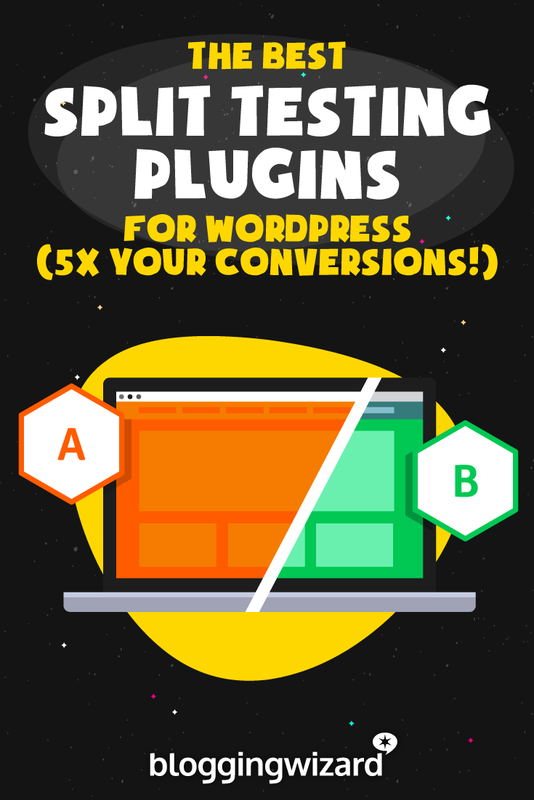 It also integrates easily with WordPress thanks to a dedicated plugin. Again, I’m going to focus specifically on Instapage’s A/B testing functionality in this section, but you can learn more about all of Instapage’s other features in my Instapage review. 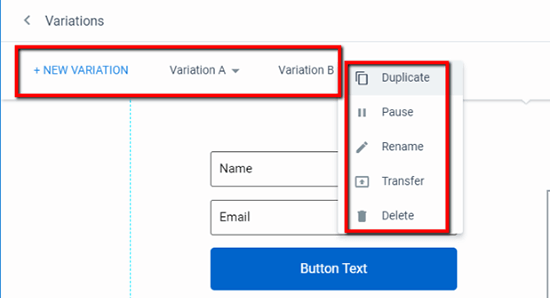 To spin up an A/B test with Instapage, you create your landing page variation by either cloning an existing landing page or building a brand new landing page from scratch. Is Instapage right for your needs? This section is going to look a lot like the Leadpages section. Essentially, the pros and cons are identical. On the pro side, Instapage makes it exceptionally simple to create a new A/B test. If those cons don’t dissuade you, your decision is probably going to be between Leadpages and Instapage’s other features, because the A/B testing functionality is pretty similar. To help you make that decision, you should check out my detailed Leadpages vs Instapage comparison. 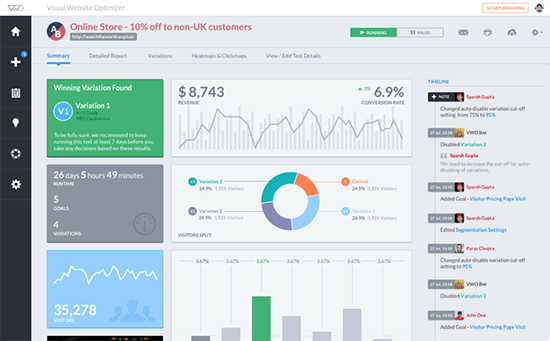 VWO, short for Visual Website Optimizer, is a standalone SaaS solution that’s focused specifically on A/B testing, rather than a general landing page tool like Leadpages and Instapage. It also includes a dedicated WordPress plugin that simplifies the integration with WordPress. In terms of comparison, VWO is most like Google Optimize in how it functions. Create variations of that page using VWO’s WYSIWYG editor. Yes – you can actually use point-and-click to edit your own website in VWO’s interface. Choose the goal of your test. You can either use custom conversion code or track things like link clicks or page visits. View your data in VWO’s dashboard. You Pay…a monthly fee based on how many visitors your tests receive. Price: VWO’s A/B testing plan starts at $49 per month (billed annually) for up to 10,000 monthly visitors. You can also get a 30-day free trial that supports 1,000 visits to test the tool. Is VWO right for your needs? In many respects, VWO’s core functionality is fairly similar to what you get with Google Optimize. So why should you pay for VWO when Google Optimize is free? Simple Page Tester brings things back to WordPress. It’s a WordPress plugin that, as the name suggests, makes it simple to set up split tests for your WordPress pages. It also operates on a freemium structure, which puts it partially in Google Optimize’s “free” camp. Then, you can divide traffic between those variants to start your split test. It doesn’t offer built-in conversion tracking. While you could get around this with your own tracking code, the easiest fix is to purchase the Premium version which does include built-in conversion tracking. You Pay…a one-time fee for unlimited use. Price: Limited free version. The Premium version starts at $59 for a single site license. Is Simple Page Tester right for your needs? Simple Page Tester’s most close comparison on this list is Thrive Optimize. In my opinion, Thrive Optimize offers a superior user interface and is a bit simpler to use. It works on custom post types as well, whereas Thrive Optimize only works on pages. It’s not tied to another plugin like how Thrive Optimize is tied to Thrive Architect. 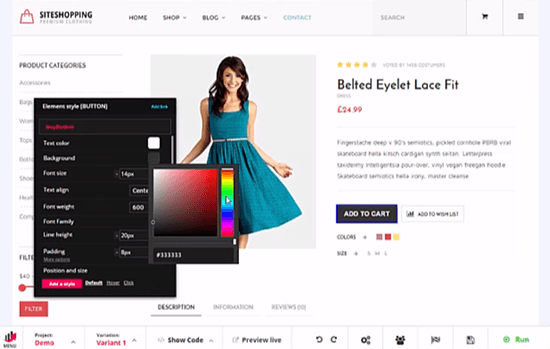 It has a dedicated WooCommerce integration, if you’re running an eCommerce store as part of your site. It’s cheaper, especially if you don’t already own Thrive Architect. Nelio A/B Testing brands itself as the “most powerful and versatile conversion optimization service for WordPress”. Having tested the plugin before, I’d agree with them on that front – it’s definitely the most flexible WordPress-specific A/B testing platform. Nelio A/B Testing can even help you test different post titles against one another. And because it’s a native WordPress plugin, you can set up your tests and view your data from inside your WordPress dashboard, rather than needing to use a separate interface like many of the other solutions. Despite that, I think the actual user interface is still fairly simple and should be accessible to most WordPress users. You Pay…a monthly fee based on how many page views your A/B tests receive. Price: You can get a free trial for your first 1,000 page views. After that, paid plans start at $29 per month for up to 5,000 tested page views (only page views with an active A/B test count towards the limit – your site’s overall traffic doesn’t matter). Is Nelio A/B Testing right for your needs? The tradeoff for access to all of those advanced features is pricing. Whereas the other two WordPress plugins are one-time fees, Nelio A/B Testing adopts monthly SaaS-style pricing that’s more in line with VWO and Leadpages/Instapage. If the pricing works for you and you want to be able to test your entire WordPress site, rather than just your content, then Nelio A/B testing is definitely your best option. With its plans starting at €199 per month, SiteGainer is the most expensive option on this list by a good margin. But, if you’ve got the budget, that price does get you access to some pretty powerful features in addition to SiteGainer’s A/B testing and multivariate testing functionality. Because this post is about split testing tools, though, I’ll start specifically with those tests. The editor is convenient because you can make a variety of style changes without needing to actually look at any code. Add personalization to your website based on weather, time of day, referral location, and lots more. Create popups for promos, surveys, email opt-ins, and more. View click/scroll heatmaps to see what visitors are actually doing on your site. Those features, plus the easy to use WYSIWYG editor, are what justify SiteGainer’s price. You Pay…a monthly fee based on how many visits your site receives per month. Is SiteGainer right for your needs? SiteGainer’s price is going to instantly put it out of reach for many people. But if you’re heavy-duty into optimization and want to be able to not just A/B test your content, but also personalize it to increase your conversion rates even more, then SiteGainer might be worth its price tag for you. Which split testing tool should you choose? Rather than trying to recommend a blanket tool for all situations, I’m going to run through some scenarios and recommend tools based on those situations. Thrive Optimize if you just want to A/B test WordPress pages (especially if you’re already using Thrive Architect). Simple Page Tester if you want a standalone solution and/or the ability to test custom post types. Nelio A/B Testing if you want to be able to test your entire WordPress site, including different themes, menus, and widgets. Leadpages if you’re a solo blogger. Instapage if you’re part of a team and/or need to collaborate with other stakeholders. Google Optimize as a good all-purpose and free solution, as long as you’re tech-savvy. VWO if you’re willing to pay for a more user-friendly experience and some extra features like heatmaps and visitor recordings. SiteGainer if you’re willing to shell out big bucks for extra features like personalization and popups. Now get out there and start optimizing your website!